We took a holiday to Ohio to visit–ahem–a close relative, and while there we took a detour to the Tremont section of Cleveland to eat at the mildly famous Lucky’s Cafe. The youngest member of our party was carrying an iPhone and we asked him to bring up our post on Tremont Henge. He did, then found another photo of it, from which he was able to determine a nearby intersection, then in a moment we were looking at an aerial view on a map site. Technology is powerful. And maybe that cafe is lucky! When we finished our meal, we walked the few blocks to the intersection, and there it was! 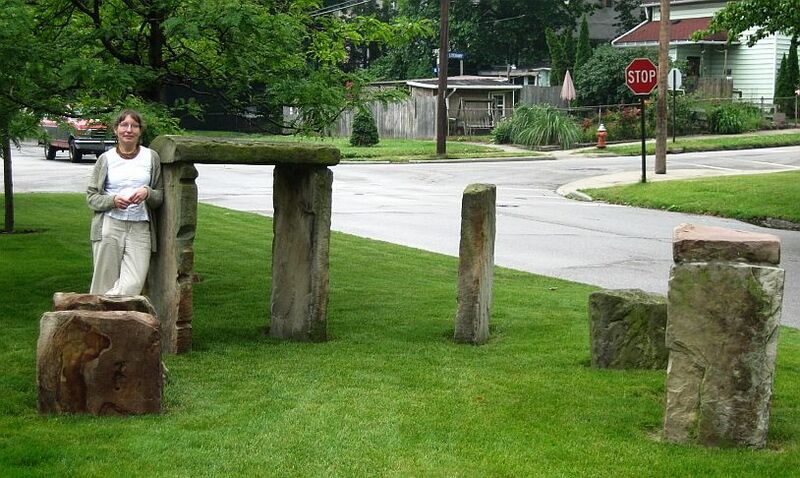 Tremont Henge, just like in the pictures. Of course Yours Truly had to pose for a picture. We were tempted to knock on the door to see if we could meet the hengers and learn their motivations, but hard as it may be to believe, Clonehenge is not yet a household word. We didn’t want to make them feel their henge was going to be a source of hassles and interruptions, and risk causing them to dismantle it. So we let them be. It’s a nice little hengy lawn piece. Despite its lack of heft, it has a solid megalithic feel. It’s an easy henge to like. Readers, if you know of any other little henges like this, please send them in! Well, not the whole henge, of course, just pictures and as much information as you can get. And Tremont hengers, if you’re out there, we would love to hear your story! We walked around Tremont and were impressed with its funky, fun atmosphere. We could enjoy living there. Of course it could use more henges! But that goes without saying. Parts of Cleveland clearly do rock! Our thanks to @jwisser for his guidance to the site and to @hombredepan for taking my picture, chauffeur service and the meal! Hmmm . . . what henge is next? 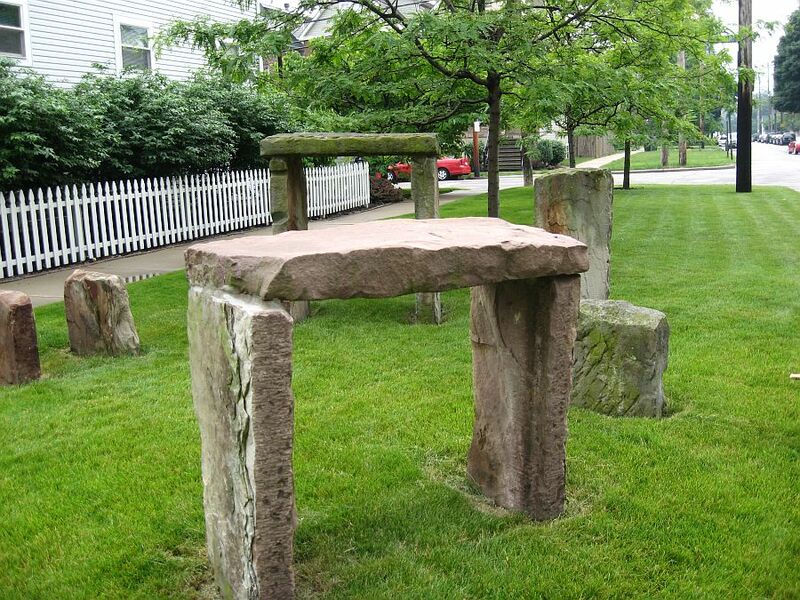 Note: You can also see Tremont Henge on Google Street View, here.